Hubris that borders on madness, the stitching together of dead and moldering materials to create a grotesque mockery of new life—if only there were some sort of metaphor to describe the many, many Frankenstein projects that are in development all of a sudden. Imagine if Janice Dickinson’s face were a monster that wanted to kill you, we guess, and you’ll have some idea of the lumbering patchwork beast currently being assembled across approximately seven different labs in Hollywood. 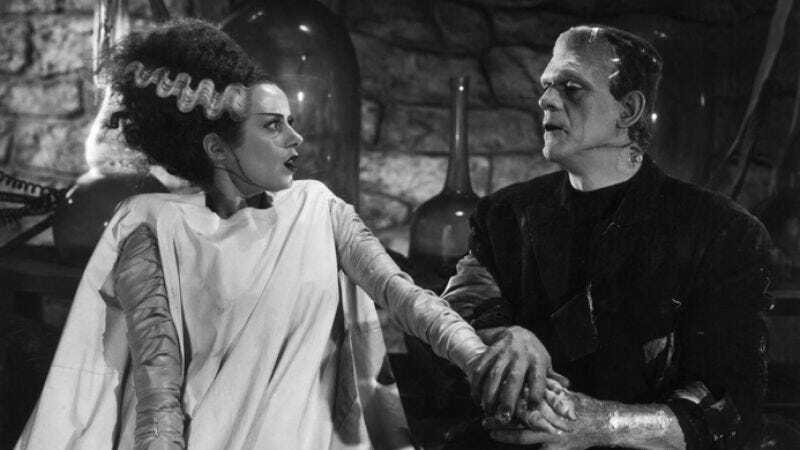 Back in December, screenwriter Craig Fernandez successfully sold his “contemporary retelling” of Mary Shelley’s classic tale, and as with any character slopped into the public domain trough, Deadline reports that it’s been set upon by several other squealing, hungry beasts, including: Universal’s own update of the classic 1931 Frankenstein that (as of now) involves Guillermo Del Toro; Twilight studio Summit’s adaptation of another supernatural young-adult novel, This Dark Endeavor: The Apprenticeship Of Victor Frankenstein, with Twilight producer Karen Rosenfelt attached to add extra Twilight; and the Sam Raimi co-produced, very similar-sounding The Casebook Of Victor Frankenstein, which also covers the mad doctor’s teen days that, in a Shakespeare In Love-style twist, find him fraternizing with Mary Shelley’s husband Percy Bysshe Shelley. Then there are other Frankenstein spins even less faithful to Shelley’s storyline, such as the Slash-produced graphic novel adaptation Wake The Dead, Fox’s remake of The Rocky Horror Picture Show, and Tim Burton’s feature-length adaptation of Frankenweenie. So that would be seven Frankenstein projects in all—although Deadline reminds us that, unlike the limitless variations provided by standard vampire and zombie stories that allow us to make them over and over, and never, ever get tired of them, “the specificity of the Frankenstein creation story probably means that only one or two of these will survive the road to production.” And given what we’ve seen with Snow White, Peter Pan, et al., they’ll probably come out within weeks of each other, a reanimated monster and his corpse bride who realize too late that they belong dead, and stagger into a fire of mutually assured destruction. Actually, that would make a pretty good movie.